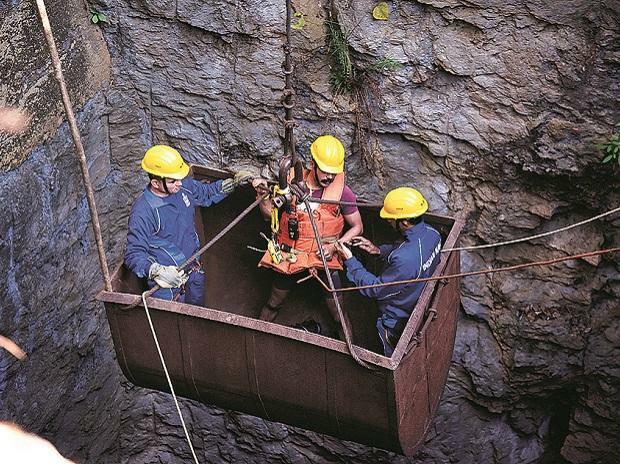 The Indian Navy abandoned all efforts on Sunday to pull out the decomposed body of a miner that it spotted four days ago inside a coal mine in Meghalaya's East Jaintia Hills District, officials said. At least 15 miners are trapped inside the mine since December 13 last year after one of them accidentally punctured the wall of the mine, leading to its flooding. "The Navy today suspended the pulling of the remains, which they had been trying since yesterday evening, as too much disintegration (of the body) took place with every pull by the ROV jaw," operation spokesperson R Susngi said. The families of four of the 15 miners had on Saturday urged the rescuers to retrieve the decomposed body so that they could perform the last rites. A multi-agency operation, which included de-watering of the main shaft where the miners are trapped, and of the nearby mines, has failed to yield any result as the water level has not gone down. The Navy divers were awaiting further instructions from the government, Susngi said. The family members of the victims from Garo Hills have also been summoned to the site to help identify the body from the video shot underwater by the ROV earlier this week. An ROV operator from Chennai went on with a search operation in the nearby mines and the Coal India continued de-watering in the two nearby abandoned shafts by running their pumps for 23 hours since Saturday evening, Susngi said. In the last 46 hours, the Coal India had pumped out over 52 lakh litres of water from the nearby abandoned mines, but it was not enough to bring down the water level that was causing hindrances in the rescue work, Susngi said. The Kirloskar Brothers Limited, which has also joined the rescue efforts, had managed to pump out over 45 lakh litres of water, he said, adding that the Odisha Fire Services had pumped out approximately 4.5 lakh litres. Meanwhile, the Meghalaya government was likely to apprise the Supreme Court of the problems in continuing with the search-and-rescue operations, an official told PTI. The apex court had earlier expressed dissatisfaction with the rescue efforts to trace the miners and rapped the Meghalaya government for not seeking the Army's help. The top court is hearing a public interest litigation (PIL), seeking steps to rescue the 15 miners. "We will put forth our views and reports and will act according to the order of the court," the official said, requesting anonymity.